Reported in the Express on 10 October 2014. 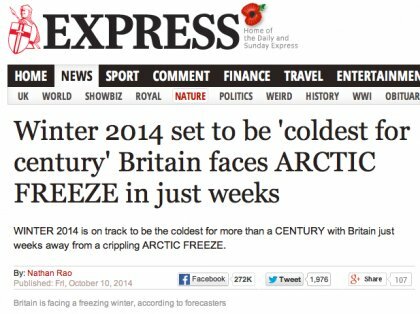 Yes, it’s that time of year again when the UK tabloids warn of huge snow storms, treacherous road conditions, record low mercury readings and an impending Arctic Freeze. At Inflowgenics we’re constantly monitoring weather conditions, reports, predictions and yes even the tabloid press’ hyped up articles of guaranteed disaster. Weather monitoring is essential to predicting when weather dependant services are required and how crews will be deployed using Inflowgenics’ management software. Predicting the winter weather for 2014 even this late in the year is impossible. That’s why service providers need to be prepared for any outcome, salt stocks need to be extensive enough for record lows without second guessing that conditions might be as warm as 2013. Systems need to be in place to deliver effective services in the most hostile of weather conditions and management teams need to be able to deliver on the impossible. We have developed our Management Software for any eventuality. If you’re worried about delivering in the 2014 and 2015 seasons speak to our team – our solution will keep you on track and ready for the Tabloid Tails of Terror!